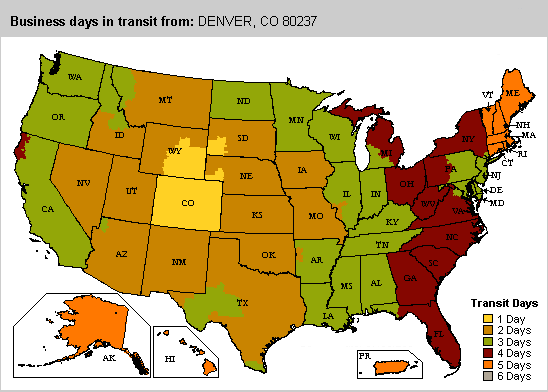 UPS ground shipments to United States addresses are usually sent out by the following business day. If you wish to have your order sent using either "2nd Day Air", "Next Day Air," or via United States Postal Service inside of the United States, you must call and place an order over the phone. If an order is placed for "2nd Day Air," or "Next Day Air," before 2 p.m. (MST) your package will be shipped the same business day it is received. If your order is damaged in shipment, you may call or e-mail us, to inform us of the damage. For damaged UPS shipments we require that you hold on to your package for up to 2 weeks, in case UPS needs to inspect the damaged shipment. If your package was shipped using USPS, you are required to retain your package and all of the contents for up to 90 days while the claim is being processed.